US Bentonite was founded in 2001 to acquire, mine, process and market high quality Wyoming sodium bentonite and related products and technologies. Known as the clay of 1,000 uses, bentonite has a wide range of industrial and commercial uses including oil and gas drilling fluids, absorbent cat litter, foundry sands, beauty supplies, iron ore pelletizing, landfill liners, foundations, dikes and levees. The Company’s mineral reserves are contained on approximately 22,000 acres with an estimated 44 million tons. Prior to halting production in November 2013, the Company was mining in two locations, was finishing reclamation in two others and had one other mine permit approved. In order to provide reliable power to the Company’s Bucknum plant, the Company was in direct dialogue with its electricity supplier. As a solution, the supplier agreed to build a new, permanent substation to provide appropriate electricity at a cost of $4 million. US Bentonite disputed the total cost of the substation project, paying the supplier $2 million of the cost. As a result, the supplier threatened to disconnect power from the Bucknum facility, forcing the Company to file bankruptcy in order to maintain power and continue production. US Bentonite continued production until the end of November 2013, when management decided to conserve the Company’s remaining cash and work toward a sale. 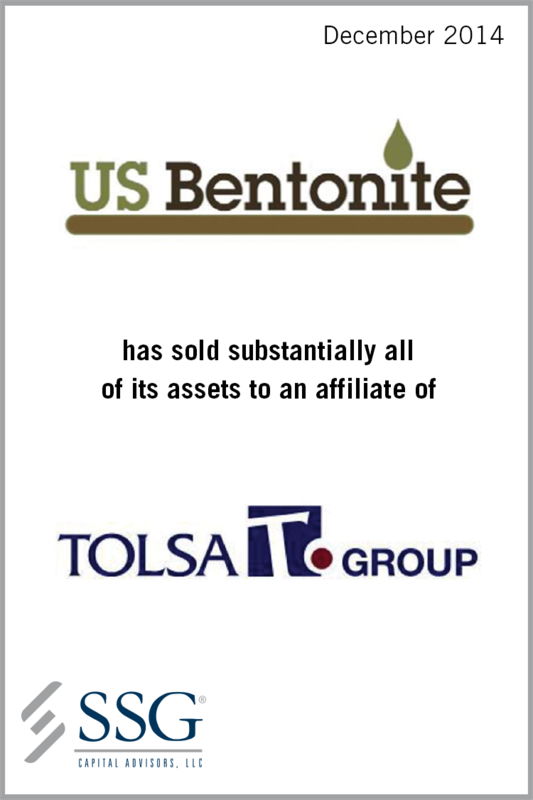 SSG was retained as US Bentonite’s investment banker to explore a sale of substantially all of the Company’s assets. SSG marketed the Company to a broad spectrum of industry and financial parties to find a strategic partner with a significant capital base to grow the business and ensure long-term viability. SSG’s ability to quickly go to market provided the Company and its stakeholders good market feedback to properly assess alternatives. The sale to Tolsa was approved by the Bankruptcy Court on December 9, 2014. SSG’s experience in condensed M&A processes and Section 363 sales enabled all key stakeholders to maximize the value of the Company and preserve US Bentonite as a going concern.